About This Map | Reflections On "The People In Between"
About This Map:My original plan for this map was to try merging several Métis trail maps available to me, including materials from the Gabriel Dumont Institute's Virtual Métis Museum, the Métis National Council Historical Onlne Database, and several older publications on Métis cart trails. However, reality soon trumped this plan, because at this scale, significant parts of the map would have turned solid orange, there are so many trails to add. So what I have done here is focused on the major lines joining the various places labelled on the map. They roughly outline the regions of greatest trail concentration, except for in the Great Lakes region where there aren't enough places to allow a clear referencing to be made. You will notice that two of the trails are made up of dotted lines, one crossing the Rocky Mountains, the other between Amiskwaskahikan (Edmonton) and Luwe Chok Tuwe (Cold Lake). Both are conjectured, although the latter has much stronger evidence for it than the former. 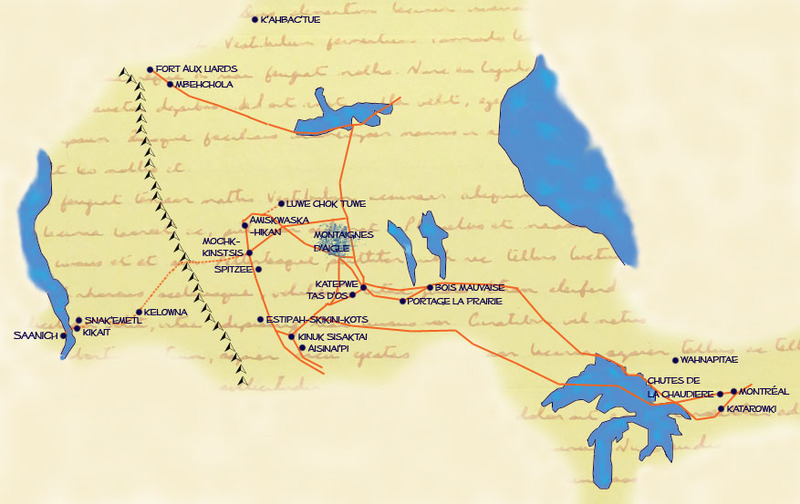 In view of the Métis involvement in the fur trade and the (for me, unexpected) Métis presence in Kelowna with its family ties out to Métis throughout much of the west, it is more than likely that there was a trail. However, I have no documented evidence for or against the idea yet. In the Amiskwaskahikan-Luwe Chok Tuew case, the Cold Lake, Lac Ste. Anne, and Elizabeth Settlement Métis communities all constitute indirect evidence. More direct evidence is my Gramma's stories, told as we drove between Edmonton and Cold Lake, including pointing out camping sites and where relatives are buried along the way. In terms of how Métis trails relate to Métis relationships with the land, they mean more than familiarity or simple presence. They are a means to reassert survival and ongoing connections to the land the trails cross and the places they connect. The recent redesignation of a main road here in Calgary "Métis Trail" demonstrates just how potent this use of the trails is. The renaming became quite controversial and almost didn't happen, in the main because of an erroneous belief that no Métis had ever come to Calgary until the current city was founded. The Alberta Metis Historical Society put that myth firmly to rest. There is one more thing the continuing memory of Métis trails does. It constitutes the one area where it may be fair and appropriate to say Métis were and are in between  that is, between one place and another place! Reflections On "The People In Between": If there's one thing we Métis can be sure of, it's that we cause suffering to non-Indigenous categorizers* everywhere. There is no uniform, singular Métis culture, yet we share experiences and aspects of identity, so much so we recognize each other even if non-Métis don't. Now, this category-busting thing is near and dear to my heart, being as I'm a Métis two-spirit who can't pass as white, or straight, or sometimes even female  which is often funny but trying as I am female and sometimes need to use public washrooms. But why should Métis be especially effective at such things in general, as opposed to an individual case like mine where I happen to be in unasked for alignment with stereotypes that expose me to more physical and social risk than most? Well, as it happens, the answer is twofold, tied together by that now cliché phrase, "the people in between." The earliest use of the phrase "the people in between" I have found is by Jacqueline Peterson in the title of her 1981 dissertation on Métis culture in the Great Lakes region. It has never appealed to me. It smacks of the stereotype of the mixed-blood destroyed because he or she can neither be "Indian" nor "white" and so must be torn apart by their internal conflict as manifested by alcoholism and criminality. Worse yet, it suggests right where racist colonial officials like us best: between them and whatever First Nations and/or poor non-native people they have just seriously pissed off. Nevertheless, the phrase has real staying power, especially with non-Métis. I struggled with this phrase for a long time, not least because my educational background is in physics and archaeology**. In both those areas, the longer a particular explanation lasts, the more assured its truth is considered to be, heedless of post-modernism*** and embarrassments like the luminiferous ether****. Then one day I happened to be listening to Richard Dawkins reading his book The Greatest Show On Earth, and finally found an explanation. His discussion is interesting as a whole, but here the part that matters1 is that essentialism posits the existence of clear, non-overlapping categories. The categories reflect divine action and perfection itself, hence the mania for collecting, labelling, and listing evident through most of European history. With that in mind, it's no wonder "the people in between" has such longevity, particularly among non-native scholars who do indeed struggle with the fact that Métis don't fit in either the "Indian" box or the "white" one. They seem very reluctant to make another box, and it is understandable that it's difficult to simply jettison essentialism. As Feminists can vouch for, there is nothing simple about removing and neutralizing four thousand odd years of nonsense. That covers the first fold of the twofold answer. The second fold extends more obviously into the non-academic corners of the world within the last ten to twenty years. At this point, if you haven't already listened to The Métis Four Times Song, you may want to do so before continuing, as I'm going to use it to frame the next part of my discussion. That said, I will provide enough detail to allow you to keep going and listen to the piece later. The Métis Four Times Song deals with four events: the 1869 Resistance at Red River, the publication of Maria Campbell's book Halfbreed, the formal inclusion of Métis in the Canadian constitution, and the publication of Olive Patricia Dickason's book Canada's First Nations. In each case Métis were and are successfully resisting colonialism and smuggling Métis contraband into awesome places where it aggravates the complacent like straw down the pants. They are historical hallmarks of which Métis have every right to be proud. They have something else very interesting in common. At the time of each of these events, the meaning of "Canadian identity" was in open question. Identities are always in flux because people change, while questioning tends to come on in bouts. At each of these times, anxieties about Canadian identity spilled out into the open, and it became especially clear that Métis are a special source of that anxiety. From what I can see, there are many non-native Canadians who both do and don't want to be native, to be Indigenous to Canada. It's something they yearn for, to find the signs of their ancestors peeking out of the land and whispering to them via place names and stories. This description may sound a bit mocking, but it reflects something real. Evidence for it ranges from the popularity of The Lord Of The Rings to that of "playing Indian" à la Archie Belamy* or even Lynn Andrews**. Yet to be Indigenous is unwanted, because fundamentally "going native" is considered a failure, and marrying into native communities is still widely considered a form of "going native." Yet this isn't the way things were supposed to work out. The British actively discouraged intermarriage with natives for fear of "miscegenation,"2 while the French encouraged intermarriage3 at least at first as they had no other choice and they fully expected the Indians to be overwritten into French people  to "go European." To the horror of colonial authorities of both nationalities, "miscegenation" happened whether they sanctioned it or not4, and instead of the natives going European, Europeans were going native as fast as they could5. In the end, as we all know it was people of British-sourced culture who came to control North America, and their mores came to prevail most in the mainstream. In the category-busting sweepstakes, this means Métis have hit the jackpot. We freak out the English Canadians, who absolutely do not want to find any native blood except for maybe an Indian princess waaaay back. We freak out the French Canadians, who feel the existence of Métis in Québec especially undermines their claims to a French identity, because practically none of them can seriously claim to be "of pure French blood." I wonder, does smacking into Métis identity in the flesh cause a train of thought something like: Ew, ew, is it catching? How do we make it stop? Oh my god, there's more of them! Some of them even look like us! It doesn't sound like me at all does it? Does it? Arrrrgh!